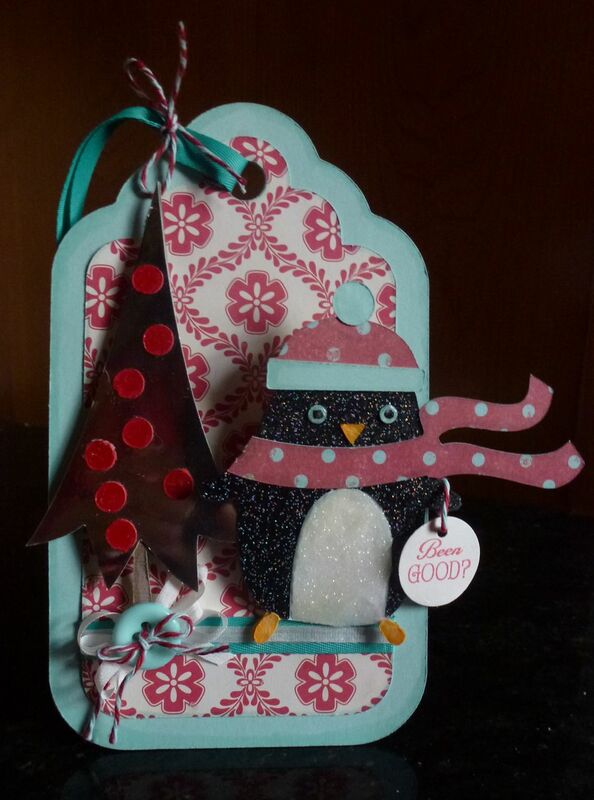 This tag uses Winter Frolic exclusively – including the tag and its background, the penguin, and the tree. It is the final touch for a young friend’s Christmas present – gift wrapping is as much fun as choosing the gift as the recipient generally looks at it for a long time before opening. The paper I selected to wrap her gift was red with silver foil polka dots. In order to get “design” alignment and contrast, I added the pale blue green at the start of the project and began searching through my stash for papers and polka dot shapes. 100% of the project, to include wrapping paper, ribbon, and even tape came from my stash – no diverts to the craft store on this one. I started with my Paper Trey Ink (PTI cardstock) in Aqua Mist and White to cut the tag (Tree1) at 4″ in height. The two base tags are adhered together. The “focus” paper is from October Afternoon and I removed the “tree” cut on the corresponding (Tree1 shift) cut using my Gypsy. Both the focus paper and the cardstock layers are edged in Copic BG10 – Cool Shadow. Next I cut the 4″ tall penguin in white PTI in order to make sure she’d be able to carry the weight of a glossy accent and glitter “belly.” The black bird parts were cut from American Craft glitter paper. After attaching the black glitter paper to the white base, I added a healthy dose of Glossy Accents let it rest a few minutes, and then sprinkled it HEAVILY with Martha Stewart glitter and tapped it in to the tacky Glossy Accents after letting it rest for about ten minutes. I did this process twice in order to build dimension and sparkle. All of the white glittered area was then shadowed with BG10. The beak and the feet were cut in PTI as well – although I cannot remember the name of the color. Now comes the fun part, I didn’t care for the penguin’s accessories and to be honest, I thought the “Straight out the the Cartridge” eyes did not fit the image I thought a happy Christmas penguin would convey. So, I made “googly eyes” using my Crop-A-Dile 3/16 inch hole punch. Simply punch in the Aqua Mist PTI cardstock, attach to your piece, and then color in the pupils. Add Glossy Accents and you are done! Next up the hat – it is from Snowman3 on Winter Frolic. I used the Cricut Craft Room to determine what size of cut would fit best of my penguin’s head. In the end, it measured 3.25″ tall. The pom pom on top of his hat is the circle cut left on the mat after removing the tag. Why? Because I thought the larger pom pom added to the character of the Penguin better than the smaller one that accompanied the hat. The scarf is from the beaver and it is cut at 4 inches. Line it up so the “knot” is alongside the left hand edge of the penguin. You will need to trim off about a quarter of an inch from the right hand side. I used the penguin to first mark where the scarf should be trimmed and I trimmed it a little further after attaching the scarf to the penguin. Tree2 is cut from mirrored paper in order to tie in the silver foil polka dots on my wrapping paper. It measures 5.25 inches in height but I decreased the width using my Gypsy. The red “balls” are from the Tree2 layer<shift>. I only used the “balls” and not the ribbon or garland in keeping with the polka dot theme. The “Been Good” is from the Waltzing Mouse Sweet Shoppe set and is stamped on a 1″ circle punched from PTI Vintage Cream cardstock. The button, ivory ribbon, and Hawaiian Shores twill ribbon are all PTI products. The twine is from the Twinery in Maraschino. I used BG10 to color the white areas as stark white and red was too great of a contrast. And my most favorite part – the penguin is on an Action Wobble spring – and it is wonderfully wobbly. So what is the takeaway from all of this – it’s your project – make it the way you want and chances are you’ll love the results. 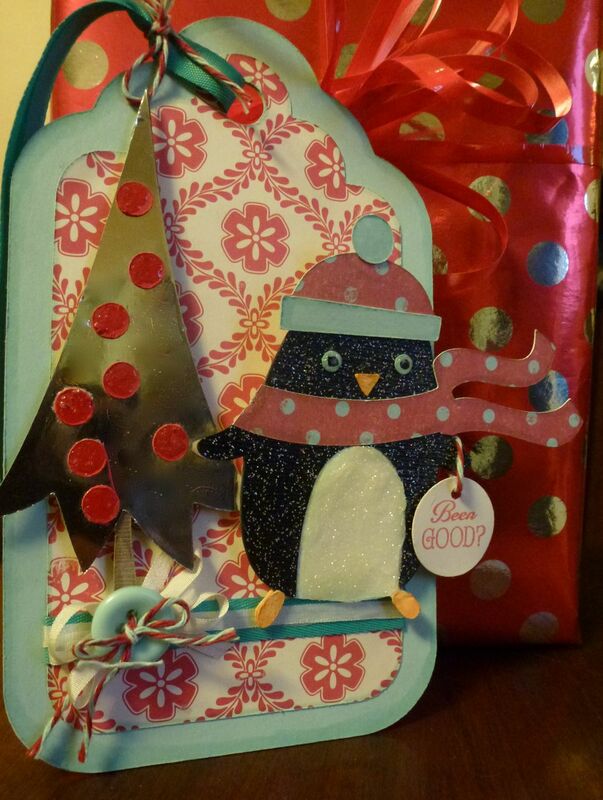 Together at last, a penguin tag and red wrapping paper with silver foil dots. This little guy is sooooo cute! I adore this tag. Love how you re-styled him using elements from other carts to put him in his Christmas finest. Love the paper choices and the glittered elements. From top to bottom, a-d-o-r-a-b-l-e! What an awesome tag! I love all the detail, he’s so cute! And the eyes are perfect! Not sure which I like better: the tag or all of the fabulous details! (You know I love the details of how it goes together!). The colors are so perfect for this tag… and just perfect for your package! I would never have thought of muted red and clear aqua, but I just love them together on this tag. Makes me re-think a few color ideas for sure!! I have gotten so lazy on my gift decoration. I don’t think I can dig deep enough this year to make such beautiful tags… but I simply adore them!!! I had to swing back over here to tell you how much the “young friend” adored this tag. She wouldn’t let her dad even hold it because he had a cup of coffee in his hand and was afraid he would soil it! She has pointed out twice now the “Been Good” attachment so I think that was a particularly fantastic part of the composition! Piper has it hanging on the tree — she completely knew that this was ornament-worthy without the benefit of reading this blog post. It is completely wonderful and, like everything you gave her, just perfect. The other tag is also hanging on the tree, despite PIper’s attempts to claim it for herself. What is so much fun about that one, aside from the absolutely sturdy nature, is the way you created depth with the “snow” on the surface for the snowman. Just magic. That recipient also adored her tag!